This new recording from Westminster Abbey presents Matins, Eucharist and Evensong as they might be heard on the Feast of St Edward (13 October). The Saint, whose death in 1066 sparked the Norman Conquest, remains buried in the Abbey to this day and his shrine is a point of global pilgrimage. The Service of Matins is centred around the Morning Canticles from Stanford’s epic Service in C, Op 115, while Evensong takes is cue from Purcell’s masterful Evening Service in G minor, Z231. The Evensong anthem is the first recording of The King and the Robin, composed for the millennial celebrations of St Edward’s birth in 1005 with music by Philip Moore and words by the Poet Laureate, Andrew Motion. The Eucharist setting is Jonathan Harvey’s adventurous Missa brevis, composed for the Abbey in 1995 and here receiving its first recording. This striking, but assuredly liturgical, work combines shouted text and chaotic choral passages into a whole of unusual impact. And here we offer more of the same immaculate performances from this A-list Church of England choir. Westminster Abbey is one of the most famous buildings in the world. It dominates the south side of Parliament Square in the very centre of London, flanking the Palace of Westminster whose architecture it partly inspired. Today the Abbey fulfils several roles. Every year over one million people from all over the world visit it. Many come to see the tombs of the Kings and Queens, including that of the Abbey’s great patron Saint Edward, who over many centuries have been interred here, and to experience for themselves the unique atmosphere of the site of so many coronations, royal funerals and weddings, and countless historic state occasions. Others come to admire the breathtaking Gothic architecture of the church and its beautiful precincts, and to look at the many fascinating memorials to illustrious figures in British life—statesmen, scientists, writers, musicians, explorers, and many others. But what has always given the Abbey its fundamental character, and underpins everything else that happens within it, is its life of prayer and worship dating back to its foundation as a Benedictine monastery over one thousand years ago. It is thought that a monastic community was established by Saint Dunstan on the present site in about 959. In the mid-eleventh century a new Abbey church was built by King Edward. In the early thirteenth century, reflecting the growing importance of devotion to the Blessed Virgin Mary, Henry III added a Lady Chapel, and later built a completely new Abbey church in the Gothic style, incorporating a new shrine for the remains of Saint Edward, which had become a significant site of pilgrimage. The Lady Chapel had its own pattern of Offices (or services) which took place in parallel with those in the main Abbey church. Later in the thirteenth century musical practice in the Lady Chapel began to diverge markedly from the plainsong sung by the monks in the Abbey church, and polyphonic music and organ music began to be included. The Abbot eventually appointed a professional musician (rather than a monk) to oversee the Lady Chapel’s music, and, most important, boys from the Abbey’s almonry school were introduced into the Lady Chapel choir. In this way the seeds of today’s Abbey Choir were sown. By the time the monastery was dissolved by Henry VIII in 1540 the daily Offices sung by the boys and men of the Lady Chapel choir had been established for many decades. The Abbey’s present choral foundation is provided for in Elizabeth I’s charter of 1560, which established the Collegiate Church of St Peter in Westminster in place of the former monastic structure and granted it the status of a ‘royal peculiar’ (that is, under the immediate authority of the Crown and independent of episcopal control). Today the Abbey is still governed according to Elizabeth’s collegiate structure and the choral foundation she established exists in much the same form. Over the centuries since the founding charter, some immensely distinguished musicians have been associated with the Abbey, including Orlando Gibbons (Organist 1623–5), Henry Purcell (1679–95), and John Blow (1669–79 and 1695–1708), and it has been the setting for the first performances of countless important works, not least those composed specially for coronations and other great occasions. 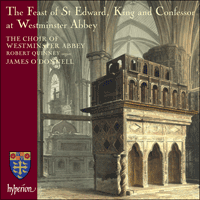 This disc contains music you might hear if you visited Westminster Abbey on the Feast of the Translation of Edward, King and Confessor, which falls on 13 October. Naturally the Abbey accords this festival particular significance and observes it with great solemnity, including special prayers and devotions at the Saint’s shrine. The disc follows the structure of the three major choral services of a great feast day, all of which have their roots in the monastic Offices that took place in the Abbey since its original foundation: Matins (or Morning Prayer); Eucharist (or Mass); and Evensong (or Evening Prayer). The Office of Matins begins with the plainsong Laudes Regiae, or Royal acclamations, sung on great and joyful occasions (such as coronations) since the time of the Emperor Charlemagne (742–814). It is likely that a version of the Laudes Regiae was sung at Edward’s Coronation in Winchester Cathedral. The Laudes were adapted for the context of their use, and the saints invoked specially chosen for the circumstances of the performance. This present-day version is based on the famous medieval English source from Worcester Cathedral. It begins by invoking the intercession of the saints associated with Westminster Abbey (including, of course, St Edward) for the Queen, and then goes on to acclaim Christ as King. With its powerful litany-like momentum and tuneful character it is not hard to see why this has become one of the most celebrated plainsong melodies. The Preces by William Smith follow, perhaps the most popular and immediately attractive of all Tudor settings. In monastic tradition the Psalms were the core of the daily Offices and the monks sang all 150 Psalms during the course of each week. The Anglican reformers spread the Psalter over a monthly cycle, although Proper Psalms are allocated to certain festivals. The chant by William Crotch used here for Psalm 132 is of particular nobility and poise, in keeping with its uplifting text. As in monastic practice the verses are sung in alternation between the two sides of the choir. Among Sir Charles Villiers Stanford’s enormous output in almost every musical medium, his many contributions to the Anglican choral repertory remain perhaps his best-known works, and certainly the most frequently performed today. The Service in C (Op 115) dates from 1909. It contains music for the Communion service, Evensong and Matins (two of whose movements are included here), and remains one of his greatest achievements in the genre. The Te Deum and Benedictus make a strong, yet contrasting, pair. The Te Deum begins straightforwardly with a simple, stepwise theme announced in unison. This is the core musical material for much of the work, and Stanford organizes the thematic structure with notable economy and imagination. For the setting of the Canticle of Zechariah, the Benedictus, he uses substantially different thematic material. It is a lyrical and sensitive treatment of the beautiful text. The phrase ‘And thou, child’ is touchingly given to the trebles alone, reminding one of a similar section in the Te Deum (‘We therefore pray thee’). The imposing final Gloria (also used in the two Evening canticles in the service, not included on this disc) makes a dramatic foil to the placid final phrase of the canticle (‘and to guide our feet into the way of peace’) in which the composer poignantly returns to his opening material. Following Smith’s Responses, including the famous setting of the Lord’s Prayer by Robert Stone (or Stones), and the three sung Collects with their choral Amens, the anthem is Henry Purcell’s well-known O God, thou art my God, dating from the early 1680s, very shortly after the composer took up the position of Organist of Westminster Abbey. It contains many imaginative touches and some effective word-painting (‘and lift up my hands in thy name’ is set to a rising scale; ‘For thy loving-kindness’ is given to an expressive trio of high solo voices), but its most celebrated moment comes in the final ‘Hallelujah’—a decidedly tuneful setting in which the two sides of the choir cast phrases back and forth, uniting only at the end. It proved so popular that the entire ‘Hallelujah’ section was later turned into the hymn tune ‘Westminster Abbey’ (usually sung to the words ‘Christ is made the sure foundation’). It seems appropriate for this Feast of St Edward to include a work specially composed for The Choir of Westminster Abbey. In 1995 the Dean and Chapter commissioned the distinguished contemporary English composer Jonathan Harvey to compose a Missa brevis. It is a striking and concentrated setting of the Ordinary of the Mass (that is, the invariable texts of the Communion service) that draws imaginatively on contemporary techniques and idioms, and yet is expressly intended to be sung liturgically. Harvey explains that the three main musical characteristics in the work can be taken to represent the glory of God (as in the opening section of the Gloria), the compassion of Jesus (the plaintive and insistent music of the Kyrie), and human suffering (parts of the Agnus Dei). A particularly interesting feature of the Gloria is Harvey’s use of shouted text alongside the sung parts. In the final, climactic section the choir seems to disintegrate into chaos as all the voices sing the music in their own time, like a babble of praise, coming together again only for the final phrase. The Sanctus begins with a still, low-set A major chord (perhaps inspired by some early Tudor Masses); at each repetition of the word ‘Sanctus’ Harvey progressively complicates the chord with added dissonant notes. The ‘Dominus Deus’ section builds up from a whisper of low voices to a striking, ringing A major ‘Hosanna’; like the opening ‘Sanctus’, this is immediately enriched with dissonant harmonies. An imposing and angular ‘Benedictus’ for solo bass follows, almost interrupted by the final ‘Hosanna’. The Agnus Dei expressively refers to music from the foregoing movements, thus drawing the Mass as a whole to a most satisfying close. The motet for Eucharist, Os iusti meditabitur, is one of Anton Bruckner’s choral masterpieces. Although he is best known today as a symphonist in the great Austro–German tradition, Bruckner’s early musical education was as a boy chorister at the Abbey of St Florian where he later became organist before studying in Vienna and then becoming organist of Linz Cathedral. Throughout his life he was profoundly religious and his sacred music forms an important part of his output. This text, consisting of verses taken from Psalm 37, is used in the Roman rite as an introit and gradual for Saints’ days (specifically Doctors of the Church). Bruckner composed this setting in 1879 for the choir of St Florian. Like most of his liturgical choral music, it is scored for an unaccompanied choir, basically in four parts but divided to enrich certain sections of the text (such as the gloriously expansive ‘Lex Dei’ in the final moments). The central section ‘et lingua eius’ is set fugally. The strictly Lydian modality of the setting lends an otherworldly feel to the music, for although the tonal centre is F the music contains no B flats. William Morley’s strongly muscular chant provides an appropriate musical vehicle for the powerful text of Psalm 99. After this follows Henry Purcell’s setting in G minor of the Evening canticles, Magnificat and Nunc dimittis, Z231. Given that Purcell held a church appointment for eighteen years of his life, he wrote surprisingly little service music and preferred to concentrate on anthems. It is known that the performing pitch of English church music of this period was higher than today’s, which is why it is often sung at a higher pitch than the notation prescribes (in this case, A minor is the performing pitch). The setting includes significant sections for soloists (or ‘verses’). In the Magnificat, set in a dancing triple metre, there are two contrasting solo groups of three voices, one low (alto, tenor and bass), the other high (two trebles and alto). The same groupings appear in the Nunc dimittis. The Gloria (‘compos’d by Mr. Rosengrave junior’) breaks the mould and begins in a more severe duple time, returning to a jollier triple time for the final section, in which a solo bass voice alternates with the choir. Although the setting is brief it has all the hallmarks of its composer’s renowned flair for imaginative word-setting and responsiveness to text. When I began thinking about the poem that has become The King and the Robin, I read a certain amount about Edward the Confessor—and realized that we know precious little about him. As a living, breathing man, that is. What we do have, though, are a number of contemporary or near-contemporary accounts of the miraculous good deeds that he was able to perform—healing the blind, for instance. This lack of precise information, combined with the suggestiveness of the healing stories, pushed me in the direction of thinking I might write something which had the feel (roughly) of a medieval lyric: the kind of poem which uses stock images and ideas (orchards, mysterious encounters and so on), and draws on their accumulated associations while adding its own emphases. The composer Philip Moore, director of music at York Minster since 1983, has responded imaginatively to the rich imagery and texture of the poem. Much of his melodic and harmonic material is derived from the first three bars of the piece and Moore takes every opportunity for word-painting and characterization; most obviously, perhaps, the King is depicted by a baritone soloist and the mythical figure of the Robin by a solo treble. The final two lines of the text, in which the two protagonists agree that both ‘action’ and ‘art’ are equally valuable and combine to make ‘a thousand years of praise’, are brilliantly set in an exciting fugue that builds up to a blazing conclusion. This disc ends with another Te Deum, this time for solo organ by the French woman organist Jeanne Demessieux. A student of Marcel Dupré, Demessieux (1921–1968) had a brilliant international career as a virtuoso and was particularly renowned for her improvisations. She was the first female organist to perform at Westminster Abbey. The Te Deum, Op 11, was written in 1965. It is closely based on the plainsong melody and, unlike many organ works based on the chant, is not an improvisatory fantasia, but instead builds up tension through the use of ostinatos and driving rhythms, allied to a powerful, sometimes dissonant harmonic language. Finally the tension erupts into a wilder, freer section resulting in a resplendent final E major chord. L’Abbaye de Westminster est sans doute l’un des plus célèbres édifices au monde. Située au cœur même de Londres, elle domine le côté sud de Parliament Square et flanque le palais de Westminster, dont elle inspira en partie l’architecture. Aujourd’hui, elle remplit plusieurs rôles importants et attire, chaque année, plus d’un million de visiteurs du monde entier, beaucoup venant pour voir les tombeaux des rois et des reines inhumés là au fil des siècles, et pour éprouver par eux-mêmes l’atmosphère unique de ce lieu, cadre de tant de couronnements, de funérailles et de mariages royaux, sans oublier d’innombrables événements historiques. Certains viennent admirer l’époustouflante architecture gothique de l’église, ainsi que sa splendide enceinte, et contempler les nombreux et fascinants mémoriaux des personnages illustres de la vie britannique—hommes d’État, scientifiques, écrivains, musiciens, explorateurs, etc. Mais ce qui a toujours été fondamental pour l’abbaye, ce qui sous-tend tout ce qui s’y passe, c’est la vie de prière et de culte qui remonte au monastère bénédictin originel, fondé voilà mille ans. On pense que saint Dunstan établit une communauté monastique sur l’actuel site vers 959. Puis, au milieu du XVIe siècle, le roi Édouard le Confesseur fit ériger une nouvelle église abbatiale, qui fut consacrée le 28 décembre 1065. Quelques jours plus tard, le roi mourut et fut inhumé en face du maître-autel. Dès lors, le culte de sa sainteté se développa, avec pour apogée sa canonisation (1161), et son tombeau devint un important lieu saint, objet d’un pèlerinage—tout comme aujourd’hui. Au début du XIIIe siècle, la dévotion à la sainte Vierge Marie gagnant en importance, Henri III ajouta une chapelle de la Vierge puis fit bâtir une toute nouvelle église abbatiale, de style gothique, avec une nouvelle châsse pour abriter les restes de saint Édouard. La chapelle de la Vierge avait ses propres offices (ou services), qui se déroulaient parallèlement à ceux de l’abbatiale principale. Plus tard, mais toujours au XIIIe siècle, la pratique musicale observée dans la chapelle de la Vierge commença de se démarquer nettement du plain-chant exécuté par les moines dans l’abbatiale: la musique polyphonique et organistique fit son apparition. Finalement, l’abbé nomma un musicien professionnel (et non un moine), qu’il chargea de superviser la musique de la chapelle de la Vierge mais aussi, et surtout, l’intégration dans le chœur de jeunes choristes issus de l’école de l’aumônerie abbatiale, semant ainsi les graines de l’actuel chœur de l’abbaye. Lorsque Henri VIII entreprit de dissoudre le monastère, en 1540, les offices quotidiens chantés par les garçons et les hommes du chœur de la chapelle de la Vierge existaient déjà depuis maintes décennies. L’actuelle institution chorale de l’abbaye est inscrite dans la charte d’Élisabeth Ire (1560), qui remplaça l’ancienne structure monastique par la collégiale de Saint-Pierre-en-Westminster, laquelle reçut le statut de «royal peculiar» (i.e. une église placée sous l’autorité directe de la Couronne, indépendamment de tout contrôle épiscopal). De nos jours, l’abbaye obéit toujours à la structure collégiale, et l’institution chorale instaurée par Élisabeth perdure sous une forme pratiquement inchangée. Au fil des siècles, des musiciens fort émérites, comme Orlando Gibbons (orgainste de 1623 à 1625), Henry Purcell (1679–1695) et John Blow (1669–1679 et 1695–1708), ont été associés à l’abbaye, qui vit la création d’innombrables œuvres importantes, à commencer par celles composées spécialement pour les couronnements et autres grands événements. La musique de ce disque est celle que l’on peut entendre à l’abbaye de Westminster le 13 octobre, pour la translation d’Édouard, roi et confesseur. Naturellement, l’abbaye accorde une importance particulière à cette fête, qu’elle observe en grande solennité, avec des prières spéciales et des dévotions à la châsse du saint. Reprenant la structure d’un grand jour de fête, ce disque s’articule autour des trois services choraux hérités des offices monastiques qui se déroulèrent à l’abbaye depuis sa fondation originelle: les Matins (ou prière du matin), l’Eucharistie (la messe) et l’Evensong (ou prière du soir). L’office de Matins s’ouvre sur les Laudes Regiae en plain-chant, acclamations royales chantées lors des grands événements joyeux (tels les couronnements) depuis l’époque de l’empereur Charlemagne (742–814). Probablement en chanta-t-on au couronnement d’Édouard, en la cathédrale de Winchester. Les Laudes étaient adaptées aux circonstances, qui déterminaient notamment le choix des saints invoqués. La présente version, fondée sur la fameuse source médiévale anglaise de la cathédrale de Worcester, invoque d’abord l’intercession des saints associés à l’abbaye de Westminster (dont, bien sûr, saint Édouard) pour la reine, avant d’acclamer le Christ en tant que roi. À entendre son puissant élan en manière de litanie et son caractère mélodieux, on comprend pourquoi cette pièce est devenue l’une des plus célèbres mélodies grégoriennes. Viennent ensuite les Preces de William Smith, peut-être la mise en musique de l’époque Tudor la plus populaire, la plus immédiatement séduisante. La tradition monastique plaçait les psaumes au cœur des offices quotidiens et, chaque semaine, les moines chantaient l’intégralité des cent cinquante psaumes. Puis les réformateurs anglicans répartirent le psautier en un cycle mensuel, non sans allouer des psaumes du propre à certaines fêtes. La psalmodie de William Crotch utilisée ici pour le psaume 132 est d’une noblesse et d’une grâce toute particulières, en phase avec ce texte édifiant. Conformément à la pratique monacale, les versets sont chantés en alternance entre les deux côtés du chœur. Si Sir Charles Villiers Stanford a énormément écrit, dans presque tous les genres musicaux, ce sont ses nombreuses contributions au répertoire choral anglican qui demeurent, peut-être, ses œuvres les plus célèbres, celles qui sont, assurément, le plus souvent jouées de nos jours. Le Service en ut (op. 115, daté de 1909), l’un de ses plus grandioses services, réunit des musiques pour la Communion, pour l’Evensong et pour Matins (dont deux mouvements sont inclus ici). Le Te Deum et le Benedictus forment un diptyque puissant, quoique contrasté. Le Te Deum s’ouvre juste sur un thème simple, par degrés conjoints, annoncé à l’unisson. Ce matériau est au cœur d’une grande partie de l’œuvre et Stanford agence la structure thématique avec une économie et une imagination remarquables. Pour mettre en musique le cantique de Zacharie (Benedictus), il recourt à un tout autre matériau thématique et traite ce magnifique texte avec lyrisme et sensibilité. La phrase «And thou, child» est confiée, de manière émouvante, aux seuls trebles, ce qui nous rappelle une section similaire du Te Deum («We therefore pray thee»). L’imposant Gloria final (également utilisée dans les deux cantiques vespéraux du service, ne figurant pas sur ce disque) fait un saisissant repoussoir à la dernière phrase placide du cantique («and to guide our feet into the way of peace»), où le compositeur revient de façon poignante à son matériau d’ouverture. Les Responses de Smith—qui incluent le fameux Notre Père mis en musique par Robert Stone (ou Stones)—et les trois collectes chantées avec leurs Amen choraux précèdent la célèbre anthem de Henry Purcell O God, thou art my God. Écrite au début des années 1680, très peu de temps après que le compositeur eut pris ses fonctions d’organiste à l’abbaye de Westminster, elle renferme maints moments inventifs et certains figuralismes efficaces («and lift up my hands in thy name» est ainsi traité selon une gamme ascendante, tandis que «For thy loving-kindness» est confié à un expressif trio de voix solo aiguës), mais son passage le plus célèbre survient dans l’«Alléluia» final—une page résolument mélodieuse où les deux côtés du chœur se renvoient des phrases avant de s’unir, à la fin. Ce passage fut si populaire que toute la section de l’«Alléluia» devint, plus tard, l’air de l’hymne «Westminster Abbey» (généralement chantée sur les mots «Christ is made the sure foundation»). Il semble opportun d’inclure ici, pour cette fête de saint Édouard, une œuvre spécialement composée pour le chœur de l’abbaye de Westminster. En 1995, le doyen et le chapitre commandèrent une Missa brevis à l’émérite compositeur anglais Jonathan Harvey. Il en résulta une mise en musique saisissante et concentrée de l’ordinaire de la messe (i.e. les textes immuables du service de la Communion) fondée, avec inventivité, sur des techniques et des idiomes contemporains, tout en demeurant expressément vouée à une exécution liturgique. Harvey voit dans les trois grandes caractéristiques musicales des l’œuvre le symbole de la gloire de Dieu (ainsi dans la section d’ouverture du Gloria), de la compassion de Jésus (la musique plaintive et insistante du Kyrie) et de la souffrance humaine (parties de l’Agnus Dei). Fait particulièrement intéressant, le Gloria donne à entendre un texte déclamé aux côtés des parties chantées. Dans la dernière section paroxystique, le chœur semble se désintégrer dans le chaos, toutes les voix chantant la musique chacune dans leur mesure, tel un babil de prières, avant de se rassembler pour la phrase finale. Le Sanctus commence par un accord en la majeur, paisible et grave (peut-être inspiré par quelque messe ancienne de l’ère Tudor); à chaque répétition du mot «Sanctus», Harvey complique un peu l’accord avec des notes dissonantes. Partant d’un murmure de voix graves, la section «Dominus Deus» enfle jusqu’à un saisissant et sonore «Hosanna» en la majeur; comme le «Sanctus» d’ouverture, cette section est immédiatement enrichie d’harmonies dissonantes. S’ensuit un «Benedictus», imposant et haché, pour basse solo, presque interrompu par l’«Hosanna» final. L’Agnus Dei renvoie avec expressivité à la musique des mouvements précédents, amenant ainsi la messe à une conclusion des plus convaincantes. Le motet pour l’Eucharistie, Os iusti meditabitur, compte parmi les chefs-d’œuvre choraux d’Anton Bruckner. Bien qu’il soit surtout connu aujourd’hui comme un symphoniste s’inscrivant dans la grande tradition austro–allemande, Bruckner fut d’abord choriste à l’abbaye de Saint-Florian, où il devint ensuite organiste avant de partir étudier à Vienne et de tenir la tribune de la cathédrale de Linz. Toute sa vie durant, il fut profondément religieux et la musique sacrée forme une part importante de son œuvre. Ce texte, qui consiste en versets du psaume 37, sert, dans le rite romain, d’introït et de graduel pour les jours des saints (en particulier les docteurs de l’Église). Bruckner le mit en musique en 1879 pour le chœur de Saint-Florian. Comme la plupart de ses pièces chorales liturgiques, ce motet est écrit pour un chœur a cappella à quatre parties, mais divisé pour enrichir certaines sections du texte (cf. le «Lex Dei» glorieusement expansif des derniers moments). La section centrale «et lingua eius» est traitée de manière fuguée. Le mode strictement lydien de cette pièce confère un caractère éthéré à la musique car, bien que le centre tonal soit fa, on ne rencontre pas un seul si bémol. La psalmodie fort musculeuse de William Morley porte idéalement le puissant texte du psaume 99. Vient ensuite la mise en musique en sol mineur que Henry Purcell fit des cantiques vespéraux que sont le Magnificat et le Nunc dimittis, Z231. Malgré dix-huit années passées à un poste d’église, Purcell composa étonnamment peu de services, préférant se concentrer sur les anthems. Sachant que la musique liturgique anglaise était alors exécutée à un diapason plus aigu qu’aujourd’hui, l’on interprète ces œuvres à un ton plus aigu que ce qui prescrit (dans le cas présent, la mineur est le son réel). La mise en musique comprend d’importantes sections pour solistes (ou «verses»). Le Magnificat, sis dans une dansante mesure ternaire, affiche deux groupes solo contrastés, de trois voix chacun, l’un grave (alto, ténor et basse), l’autre aigu (deux trebles et alto). Ces mêmes groupes apparaissent dans le Nunc dimittis. Le Gloria («compos’d by Mr. Rosengrave junior») casse le moule et s’ouvre sur une mesure binaire davantage austère, revenant à une mesure ternaire plus enjouée pour la section finale, où une voix de basse solo alterne avec le chœur. Quoique brève, la mise en musique présente tous les sceaux du fameux instinct du compositeur pour apporter une réponse inventive au texte. Lorsque j’ai commencé à réfléchir au poème qui est devenu The King and the Robin, j’ai lu un certain nombre d’ouvrages sur Édouard le Confesseur et j’ai réalisé qu’on savait très peu de choses sur lui. En tant qu’homme qui vit et qui respire, j’entends. Ce que nous avons, en revanche, c’est un certain nombre de récits contemporains ou quasi contemporains sur les actes miraculeux qu’il était capable d’accomplir—guérir les aveugles, par exemple. Ce manque d’informations précises, combiné à la suggestivité des récits de guérison, me porta à penser que je pourrais écrire quelque chose ayant (peu ou prou) l’atmosphère d’un poème lyrique médiéval—le genre de poème qui use d’images et d’idées toutes faites (vergers, rencontres mystérieuses, etc.) et s’appuie sur leurs associations cumulées tout en apportant ses propres emphases. Le compositeur Philip Moore, qui dirige la musique à la cathédrale d’York depuis 1983, a apporté une réponse imaginative à la richesse d’images et de texture du poème. Une grande partie de son matériau mélodico-harmonique provient des trois premières mesures de la pièce et Moore ne rate aucune occasion de figuralisme et de caractérisation, la plus évidente étant, peut-être, cette manière de représenter le roi par un soliste baryton et la figure mythique du rouge-gorge par un treble solo. Les deux derniers vers du poème, où les deux protagonistes s’accordent sur le fait qu’«action» et «art» sont également précieux et se combinent pour donner «mille années de louange», sont brillamment mis en musique dans une passionnante fugue débouchant sur une étincelante conclusion. Ce disque s’achève sur un autre Te Deum, cette fois pour orgue solo, de l’organiste française Jeanne Demessieux (1921–1968). Cette élève de Marcel Dupré, qui connut une brillante carrière internationale de virtuose (particulièrement réputée pour ses improvisations), fut la première femme organiste à jouer à l’abbaye de Westminster. Écrit en 1965, son Te Deum, op.11 repose étroitement sur la mélodie grégorienne. Mais, contrairement à la maintes œuvres d’orgue fondées sur le plain-chant, il n’est en rien une fantaisie de caractère improvisé et bâtit une tension via l’usage d’ostinatos et de rythmes battants, alliés à un langage harmonique puissant, parfois dissonant. Finalement, la tension jaillit en une section plus déchaînée, plus libre, qui aboutit à un resplendissant accord en ré majeur. Die Westminster Abtei gehört sicherlich zu den berühmtesten Gebäuden der Welt. Sie dominiert die Südseite des Parliament Square im Herzen Londons und flankiert den Westminster Palast, dessen Architektur durch die Abtei unter anderem inspiriert wurde. Heute nimmt die Abtei mehrere verschiedene und wichtige Funktionen ein. Jedes Jahr wird sie von mehr als einer Million Menschen aus aller Welt besichtigt. Viele kommen, um sich die Grabmäler der Könige und Königinnen anzuschauen, die hier über viele Jahrhunderte hinweg beigesetzt worden sind, und um die einzigartige Atmosphäre eines Ortes zu erleben, an dem so viele Krönungen, königliche Hochzeiten und Beerdigungen und zahllose Staatsfeierlichkeiten vollzogen worden sind. Andere kommen, um die atemberaubende gotische Architektur der Kirche und ihres wunderschönen Geländes zu bewundern und die vielen faszinierenden Denkmäler berühmter Figuren der britischen Gesellschaft zu sehen—Staatsmänner, Wissenschaftler, Schriftsteller, Musiker, Forscher und viele mehr. Was jedoch der Abtei schon immer ihren eigentlichen Charakter verliehen hat und was alles anderem, das in ihr passiert, zu Grunde liegt, ist ihr Dasein als Ort des Gebets und der Andacht, das bis zu ihrer Gründung als benediktinisches Kloster vor über tausend Jahren zurückgeht. Es wird angenommen, dass der Heilige Dunstan um etwa 959 an der heutigen Stelle eine Klostergemeinschaft gründete. Um die Mitte des 11. Jahrhunderts ließ König Edward der Bekenner eine neue Abtei erbauen, die am 28. Dezember 1065 geweiht wurde. Wenige Tage später starb der König und wurde vor dem Hochaltar beigesetzt. Es entwickelte sich ein Kult um ihn, der 1161 in seiner Heiligsprechung kulminierte; gleichzeitig wurde sein Grabmal ein wichtiger Schrein und eine Pilgerstätte, was sich bis heute erhalten hat. Im frühen 13. Jahrhundert brachte Henry III. die zunehmende Wichtigkeit des Marienkults zum Ausdruck, indem er eine Marienkapelle hinzufügen und später eine völlig neue Abteikirche im gotischen Stil bauen ließ, in der ein neuer Schrein für die menschlichen Überreste des Heiligen Edward errichtet wurde. Die Marienkapelle hatte ihre eigene Offizien- (oder Gottesdienst-) Abfolge, die parallel zu denjenigen in der Abteikirche stattfanden. Später im 13. Jahrhundert begann die Musikpraxis der Marienkapelle sich deutlich von dem einstimmigen Choral, den die Mönche in der Abteikirche sangen, zu unterscheiden: Polyphonie und Orgelmusik wurden allmählich in die Gottesdienste mit einbezogen. Der Abt berief schließlich einen professionellen Musiker (nicht einen Mönch) dazu, die Musik der Marienkapelle zu beaufsichtigen und, noch wichtiger, Sängerknaben von der Armenschule der Abtei in den Chor der Marienkapelle einzuführen. Auf diese Weise wurde der Grundstein für den heutigen Abteichor gesetzt. Als das Kloster 1540 von Henry VIII. aufgelöst wurde, war es bereits eine jahrzehntelange Tradition, dass die Knaben und Männer des Chors der Marienkapelle die täglichen Offizien sangen. Der heutige Aufbau des Chors wurde durch eine Charta Elizabeths I. von 1560 festgelegt, der zufolge die Collegiate Church of St. Peter an die Stelle der früheren Klosterstruktur gestellt wurde und sie den Status des „royal peculiar“ (das bedeutet, dass die Kirche unter der unmittelbaren Gewalt der Krone stand und von bischöflicher Kontrolle befreit war) erhielt. Noch heute wird die Abtei nach Elizabeths Kollegiatsstruktur verwaltet und der von ihr eingeführte Choraufbau existiert noch in sehr ähnlicher Weise. Seit der Gründungscharta sind über Jahrhunderte hinweg zahlreiche hervorragende Musiker in den Dienst der Abtei getreten, darunter Orlando Gibbons (Organist 1623–25), Henry Purcell (1679–95) und John Blow (1669–79 und 1695–1708). Zudem sind hier zahllose wichtige Werke uraufgeführt worden, nicht zuletzt die, die für Krönungen und ähnliche große Anlässe entstanden waren. Diese CD enthält Musik, die man hören könnte, wenn man die Westminster Abbey am Festtag der Umbettung des Leichnams von Eduard, König und Bekenner, besucht, der auf den 13. Oktober fällt. Die Abbey gibt diesem Festtag natürlich besonderes Gewicht und hält ihn mit großer Feierlichkeit ein, einschließlich besonderer Gebete und Andachten am Schrein des Heiligen. Die CD folgt der Gliederung der drei Hauptgottesdienste mit Chor für hohe Festtage, die ihren Ursprung in den monastischen Offizien haben, die seit ihrer Gründung in der Abbey stattfinden: Matutin (oder Morgenandacht), Eucharistie (oder Messe) und Evensong (oder Abendandacht). Das Offizium der Matutin beginnt mit dem Choral Laudes Regiae (den Königlichen Akklamationen), die seit der Zeit des Kaisers Karls des Großen (742–814) zu bedeutenden oder besonders freudigen Anlässen (wie etwa Krönungen) gesungen werden. Es ist wahrscheinlich, dass eine Version der Laudes Regiae bei Eduards Krönung in der Kathedrale von Winchester gesungen wurde. Die Laudes wurden ihrem jeweiligen Anlass angepasst, und die Heiligen, die angerufen werden, entsprechend den Umständen der Aufführung ausgewählt. Die heutige Fassung basiert auf der berühmten mittelalterlichen Quelle in der Kathedrale von Worcester. Sie beginnt mit den Fürbitten der mit der Westminster Abbey assoziierten Heiligen (darunter natürlich der Hl. Eduard) für die englische Königin und feiert dann Christus als König. Mit seiner kraftvollen Dynamik und seinem melodiösen Charakter lässt sich leicht verstehen, warum dies einer der berühmtesten Choralgesänge ist. Es folgen die Preces von William Smith, womöglich die populärste und unmittelbar ansprechendste Vertonung aus der Tudorzeit. In der monastischen Tradition standen die Psalmen im Zentrum der täglichen Offizien und innerhalb jeder Woche sangen die Mönche alle 150 Psalmen. Die anglikanischen Reformierer erstreckten die Psalmen über einen monatlichen Zyklus, obwohl bestimmten Festtagen reguläre Psalmen zugeordnet wurden. Der Satz von William Crotch, der hier für Psalm 132 verwendet wird, besitzt im Einklang mit seinem feierlichen Text besonders erhabene Eleganz. Wie in der monastischen Praxis üblich werden die Verse im Wechselgesang zwischen den beiden Chören gesungen. Unter dem enormen Œuvre in nahezu jedem musikalischenMedium von Sir Charles Villiers Stanford gehören seine Beiträge zum anglikanischen Chorrepertoire wohl zu seinen bestbekannten und sicherlich heute am häufigsten aufgeführten Werken. Der Service (Gottesdienst) in C (Op. 115) datiert von 1909. Er enthält Musik für Kommunionsgottesdienst, Abendandacht und Morgenandacht (woraus zwei Sätze hier aufgenommen wurden) und bleibt eine seiner größten Errungenschaften in diesem Genre. Das Te Deum und Benedictus bilden ein überzeugendes, aber kontrastierendes Paar. Das Te Deum beginnt unkompliziert mit einem schlichten, stufenweise voranschreitenden Thema im Unisono. Dies ist das musikalische Keimmaterial für einen Großteil des Werkes, und Stanford organisiert das thematische Material mit bemerkenswerter Ökonomie und Phantasie. Für die Vertonung des Benedictus, dem Lobgesang des Sacharja, verwendet er im Wesentlichen anderes thematisches Material. Es ist eine lyrische und feinfühlige Behandlung des herrlichen Textes. Die Phrase „Und du, Kind“ wird rührend den Sopranisten allein übergeben, was an eine ähnliche Stelle im Te Deum („Wir bitten dich daher“) erinnert. Das imposante abschließende Gloria (das ebenfalls in den beiden Abend-Lobgesängen des Service verwendet wird, die nicht auf dieser CD aufgenommen wurden) bildet ein dramatisches Gegenstück zur sanften Endphrase des Lobgesangs („und unsere Füße auf den Weg des Friedens zu leiten“), in der der Komponist ergreifend zu seinem Anfangsmaterial zurückkehrt. Nach Smiths Responsorien, einschließlich der berühmten Vertonung des Vaterunsers von Robert Stone (oder Stones) und den drei gesungenen Kollekten mit ihren Chor-Amen, folgt als Anthem (oder Motette) Henry Purcells berühmtes O God, thou art my God aus den frühen 1680er Jahren, kurz nachdem der Komponist die Position als Organist an der Westminster Abbey eingenommen hatte. Es enthält viele einfallsreiche Züge und einige wirkungsvolle Wortmalereien („und erhebe meine Hände in Deinem Namen“ ist als aufsteigende Tonleiter gesetzt; „Für deine liebende Güte“ wird einem expressiven Trio hoher Solostimmen übergeben) aber sein berümtester Moment kommt im abschließenden „Hallelujah“—einem ausgesprochen melodiösen Satz, in dem die beiden Seiten des Chors Phrasen abwechseln, und sich erst am Ende vereinigen. Dieses „Hallelujah“ wurde so populär, dass es später komplett in das Kirchenlied „Westminster Abbey“ verwandelt wurde (das gewöhnlich zu den Worten „Christ is made the sure foundation“, „Christus wird zum sicheren Fundament gemacht“, gesungen wird). Es scheint angemessen, für dieses Fest des Heiligen Eduard ein Werk aufzunehem, das speziell für den Chor der Westminster Abbey komponiert wurde. 1995 gaben Dekan und Domkapitel bei dem renommierten zeitgenössischen englischen Komponisten Jonathan Harvey eine Missa brevis in Auftrag. Es ist eine erstaunliche, konzentrierte Vertonung des Messordinariums (d. h. der unveränderlichen Texte des Kommunionsgottesdienstes), die sich einfallsreich auf zeitgenössische Techniken und Idiome bezieht, aber dennoch ausdrücklich zur liturgischen Aufführung gedacht ist. Harvey erklärt, dass die drei musikalischen Hauptmerkmale des Werkes als Repräsentation der Glorie Gottes (wie im Anfang des Gloria), des Erbarmens Jesu (die klagende und eindringliche Musik des Kyrie) und des menschlichen Leidens (Teile des Agnus Dei) verstanden werden kann. Ein besonders interessantes Merkmal im Gloria ist Harveys Gebrauch von gerufenem Text neben gesungenem. Am Ende kulminiert es in in einem Abschnitt, in dem der Chor in Chaos zu verfallen droht, als alle Stimmen wie in einer gemurmelten Lobpreisung in ihrem eigenen Tempo singen, und erst für die letzte Phrase wieder zusammenkommen. Das Sanctus beginnt mit einem ruhigen, tief gesetzten A-Dur-Akkord (womöglich von einigen Messen der frühen Tudorzeit angeregt); bei jeder Wiederholung des Wortes „Sanctus“ kompliziert Harvey den Akkord nach und nach durch zusätzliche dissonante Noten. Der Abschnitt „Dominus Deus“ eskaliert von einem Wispern tiefer Stimmen in ein erstaunliches, schallendes „Hosanna“; wie das einleitende „Sanctus“ wird auch dies sofort mit dissonanter Harmonik angereichert. Es folgt ein imposantes, kantiges „Benedictus“ für Solo-Bass, praktisch vom letzten „Hosanna“ unterbrochen. Das Agnus Dei bezieht sich ausdrucksvoll auf die Musik der vorhergehenden Sätze zurück und bringt daher die Messe insgesamt zu einem äußerst befriedigenden Abschluss. Die Motette für die Eucharistie, Os iusti meditabitur ist eines der Chormeisterwerke von Anton Bruckner. Obwohl er heutzutage am besten als Symphoniker in der deutsch–österreichischen Tradition bekannt ist, erhielt er seine frühe musikalische Ausbildung als Chorknabe am Stift St. Florian, wo er später Organist war, bevor er in Wien studierte und Organist am Dom in Linz wurde. Zeit seines Lebens war er tief religiös, und seine geistliche Musik stellt einen bedeutenden Teil seines Œuvres dar. Dieser Text, der aus Versen aus dem 37. Psalm besteht, wird im römischen Ritus als Introitus und Graduale für Heiligentage (besonders für Kirchenlehrer) verwendet. Bruckner komponierte diese Vertonung von 1879 für den Chor von St. Florian. Wie viele seiner liturgischen Chormusik ist sie für Chor a cappella gesetzt, im wesentlich für vier Stimmen, die jedoch geteilt werden, um bestimmte Stellen des Textes (wie etwa die glorreiche Entfaltung des „Lex Dei“ in den abschließenden Momenten) zu bereichern. Der Mittelteil, „et lingua eius“ ist fugal gesetzt. Die strikt lydische Modalität verleiht dem Satz eine ätherische Qualität—obwohl das tonale Zentrum F ist, enthält die Musik keine Bs. William Morleys muskulöser Choral bietet ein angemessenes musikalisches Medium für den prägnanten Text des 99. Psalms. Darauf folgt Henry Purcells g-Moll Vertonung der abendlichen Lobgesänge Magnificat und Nunc dimittis, Z231. Wenn man bedenkt, dass Purcell 18 Jahre lang ein Kirchenamt innehatte, schrieb er überraschend wenig Musik für den Gottesdienst und konzentrierte sich stattdessen auf Anthems (oder Motetten). Es ist bekannt, dass der Kirchenton in der englischen Musik dieser Zeit höher war als heute, und daher wird sie oft höher gesungen als die Notation vorschreibt (in diesem Fall nach a-Moll transponiert). Die Vertonung enthält ausgedehnte Abschnitte für Solisten (oder „Verse“). Im Magnificat in tänzerischem Dreiertakt gibt es zwei kontrastierende Sologruppen von drei Stimmen, eine tief (Alt, Tenor und Bass), die andere hoch (zwei Soprane und Alt). Die gleiche Gruppierung findet sich auch im Nunc dimittis. Das Gloria („komponiert von Mr. Rosengrave junior“) bricht aus der etablierten Form aus und beginnt in strengerem Zweiertakt, kehrt aber für den letzten Abschnitt, in dem ein Solo-Bass mit dem Chor alterniert, zu einem fröhlicheren Dreiertakt zurück. Obwohl der Satz kurz ist, trägt er alle Markenzeichen des Komponisten mit seinem berühmten Flair für einfallsreiche Wortvertonung und seine Feinfühligkeit für den Text. Als ich begann, über das Gedicht nachzudenken, das The King and the Robin werden sollte, las ich eine Menge über Eduard den Bekenner—und erkannte, dass wir nur wenig über ihn wissen. D. h. über den Menschen, der lebte und atmete. Wir besitzen jedoch eine Anzahl zeitgenössischer oder nahezu zeitgenössischer Berichte über seine guten Taten und die Wunder, die er wirken konnte—z. B. Heilung von Blinden. Dieser Mangel an genauer Information zusammen mit der Zweideutigkeit der Heilungsgeschichten, drängte mich in die Richtung, etwas schreiben zu wollen, das (etwa) das Gefühl mittelalterlicher Lyrik hat. Die Art von Dichtung, die Standard-Bilder und -Ideen enthält (Obstgärten, mysteriöse Begegnungen u.s.w. ), auf ihre verschiedenen Assoziationen zurückgreift und eigene Schwerpunkte setzt. Der Komponist Philip Moore, Musikdirektor am York Minster seit 1983, hat phantasievoll auf die reiche Bildhaftigkeit und Struktur der Dichtung reagiert. Viel seines melodischen und harmonischen Materials leitet sich aus den ersten drei Takten des Stückes ab, und Moore nimmt jede Gelegenheit für Wortmalerei und Charakterisierung wahr; am offensichtlichsten womöglich in der Repräsentation des Königs durch einen sonoren Bariton und des Rotkehlchens durch einen (Knaben)sopran. Die beiden letzten Zeilen des Texts, in dem die beiden Protagonisten übereinstimmen, dass sowohl „Handlung“ wie „Kunst“ gleichermaßen wertvoll sind und sich vereinen, um „tausend Jahre Lob“ zu schaffen, sind brillant als fesselnde Fuge gesetzt, die in einem glühenden Abschluss kulminiert. Diese CD endet mit einem weiteren Te Deum, diesmal für Orgel solo von der französischen Organistin Jeanne Desmessieux (1921–1968). Sie war eine Studentin von Marcel Dupré, hatte eine brillante internationale Karriere als Virtuosin und war besonders für ihre Improvisationen berühmt. Sie war die erste Frau, die in der Westminster Abbey Orgel spielen sollte. Das Te Deum, Op. 11, wurde 1965 geschrieben. Es hält sich eng an die Choralmelodie und ist im Gegensatz zu vielen Orgelwerken, die auf der Choralmelodie basieren, keine improvisatorische Phantasie, sondern baut ihre Spannung durch den Gebrauch von Ostinati und treibenden Rhythmen vereint mit einer kraftvollen, oft dissonanten harmonischen Sprache auf. Diese Spannung bricht schließlich in einer wilderen, freieren Passage, die in einem prächtigen Schlussakkord in E-Dur kulminiert. Edward the Confessor was the son of Ethelred the Unready and Emma, daughter of Duke Richard I of Normandy. Born in or shortly before 1005, at a time when England was racked by Danish invasions, he was sent to Normandy at the age of eight to escape the fighting and the attentions of the victorious King Cnut. Edward remained in Normandy until he was thirty-six, while Cnut reigned in England, married to Edward’s mother. On the death of Cnut and Emma’s son Harthacnut in 1042, Edward succeeded peacefully to the throne with the support of the powerful Godwine, Earl of Wessex. Edward’s reign was generally peaceful; he married Godwine’s daughter Edith, and after Godwine’s death Edith’s brother Harold became the most powerful man in England. Edward died in January 1066; his intentions for the succession have been controversial ever since. Harold claimed the throne, disputed by William of Normandy who claimed to be Edward’s heir. The consequence was the Battle of Hastings and the Norman conquest. An odour of sanctity had settled around Edward in his last years, and miracles began to be reported. His devotion to the Church was proved by his work at Westminster Abbey, which he rebuilt on a vast scale as his mausoleum in the new Romaneque style, also greatly increasing the endowment by generous gifts of land, turning the existing small Benedictine monastery into a national institution. Westminster’s association with Edward ensured that it became the coronation church, and Edward’s canonization in 1161 sealed his future as England’s principal royal saint. The cult was enthusiastically promoted by the monks of Westminster, who found a ready audience, especially in royal circles. Eight subsequent medieval kings and queens were buried round his shrine, and several of them further increased the Abbey’s wealth in return for the prayers of the monks. At the dissolution of monasteries in 1540, Westminster Abbey was the second wealthiest monastery in England. As well as the full monastic round of prayer, its liturgical life was marked by commemorative and intercessory services, often on the grandest scale, for its royal benefactors. In 2005 the Abbey celebrated the millennium of Edward the Confessor with concerts, a pageant, a conference, exhibitions and special services. He is the only major English saint whose body still rests in his shrine, and his presence is still felt at Westminster today.